My name is Serenity Bolt. In between my travels, I live in Vermont with my dog, Atticus. My blog is a collection of things I like (photography, art, books, food, and fashion), how-to's and recipes, and snippets of my day. Every once in a while, something comes along that hits that nerve between pure envy and churning missed opportunity, that idea you almost had, should have had but…let’s face it, didn’t. 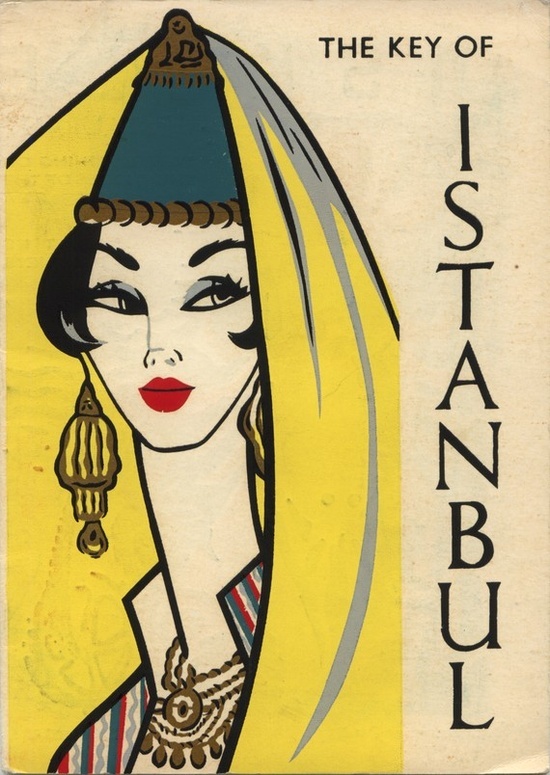 At least, not in time to beat the launch of Bly, a brilliant site that allows you to travel and shop some of the world’s best bazaars and flea markets. Bly will visit a new city every two months, offering over 200 one-of-a-kind home goods and accessories along with profiles of various local artisans, insightful stories and street photography. Yep, that’s the kicker. They offer prints for sale, too. Seriously, why didn’t I think of this!? 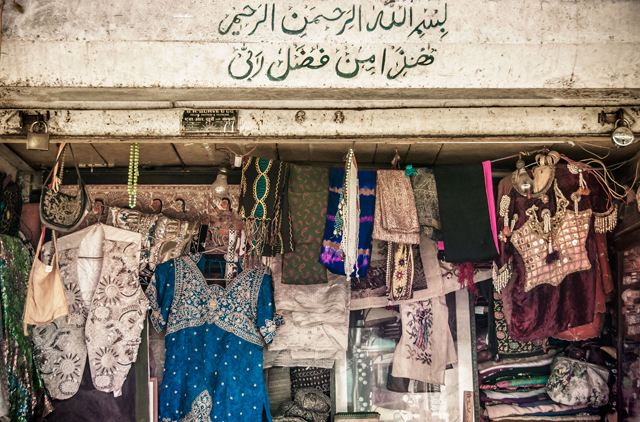 This month features Mumbai, India, and next up on the list are Kumasi, Ghana and Bukhara, and Uzbekistan. 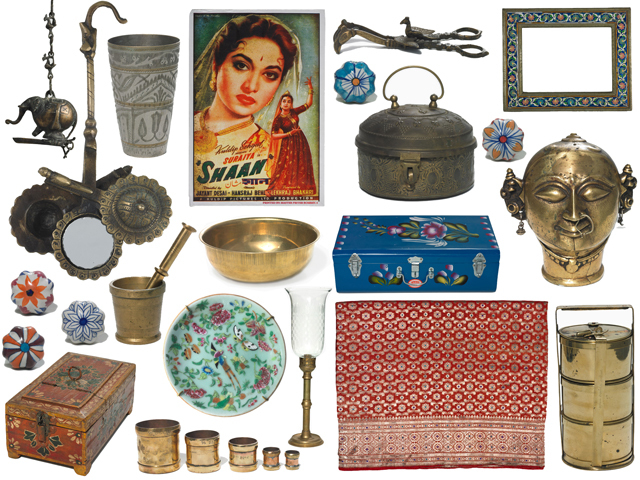 In the meantime, I’ll be busy shopping for looking at and imagining how little these vintage saris, antique brass objects, and handpainted trunks actually cost in the markets . . .and wishing I was there. Unfortunately, the Eames family appears to have run into hard times. The Eames Foundation is selling these 4 original limited-edition prints to help preserve Charles’ and Ray’s historic mid-century modern home in LA. For every $75 print sold, Herman Miller and Vitra will provide matching donations. How often does owning a rare piece of artwork also give you a chance to play a part in architectural history? If you haven’t seen the house, it is super cool. P.S. apparently there is also an Eames documentary, The Architect & The Painter. Have you seen it yet? Well since you asked, I’ve been taking a winter-long hiatus from the blogosphere in order to focus on travel, photography, and my current work in cross-cultural communication. As this is not a travel blog, I decided not to post stories from my adventures throughout the winter. To sum it up, they involved immersion into the European psy trance scene, homestays in a rural Turkish village with poke-down (not flush, not outdoor!) toilets, seaside villas, and much communication through charades in various awkward and fantastic situations. I am back in the soon-to-be-greener state of Vermont, so you can expect my usual transmissions of somewhat useless information, photography, and craft projects. I am currently in the process of editing a massive stack of new images for my photography site, so stay tuned! 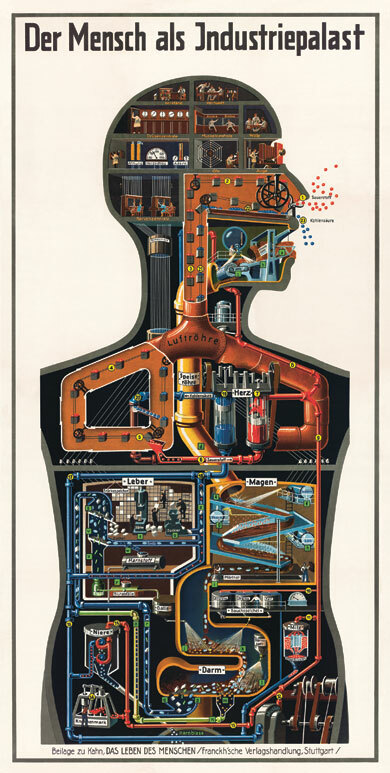 These visualizations of the human body as a modernist “industrial palace” by Fritz Kahn were meant to be instructive, developed to educate the public about human health in the 1920’s. 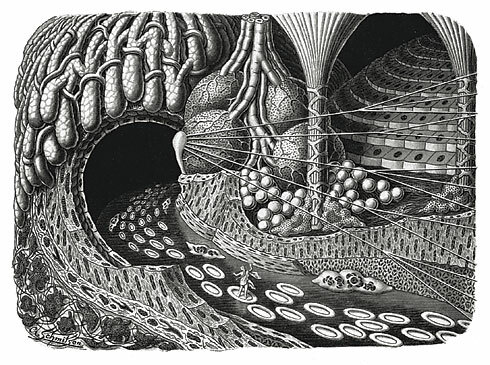 Industrial and technological imagery are juxtaposed with organic, sometimes even sensuous forms in which the complex structure of the human body is rendered into cold, lifeless machinery. Kahn’s illustrations reflect a world that was rapidly shifting to a “new nature” in which people could now fly, voices could be heard and recorded, and work was made increasingly more efficient. 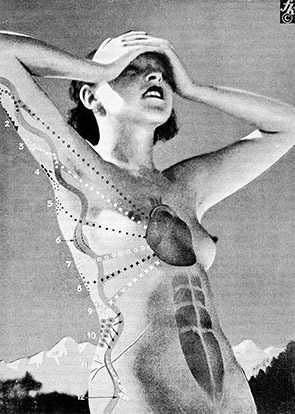 Das Leben des Menschen (The Life of Man) was an encyclopedic work of 1600 pages and 1200 illustrations depicting biology as industrial and mechanical processes, adopting avant-garde visual techniques and contemporary styles such as Neue Sachlichkeit, Dada, Surrealism, and Constructivist photomontage. Ever-concerned with de-mystifying the miracle of life with easily comprehensible words and pictures, Kahn wrote “The cell state is a republic under the hereditary hegemony of the mind’s aristocracy….its economic system is a strict communism.” Unsurprisingly, his books were placed on the Nazi “list of harmful and unwanted writings” and publicly burned. His medical license was revoked, and Kahn (a Jew) was forced to emigrate — first to Palestine, then Paris and eventually, with help from Albert Einstein, the United States. 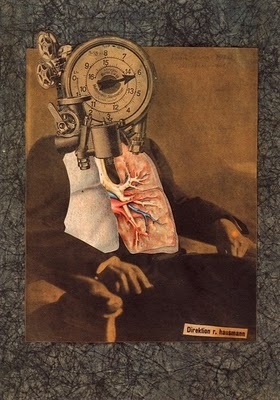 Kahn drew on previous and contemporary analogies between functional anatomy and technology as well as themes of modernity present in contemporary art (such as Raoul Hausmann’s Dada collage, above.) 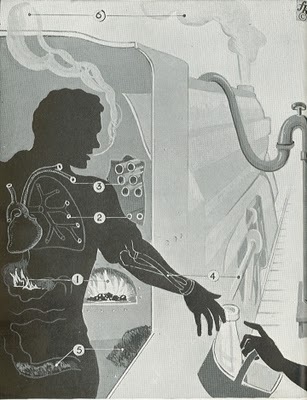 The mechanized battles of the First World War (and the widespread use of protheses thereafter) had helped to produce a man­-machine analogue that made Kahn’s illustrations possible. Forgotten for many years after being exiled by the Third Reich, Fritz Kahn’s work is now being rediscovered by historians, artists, and designers. 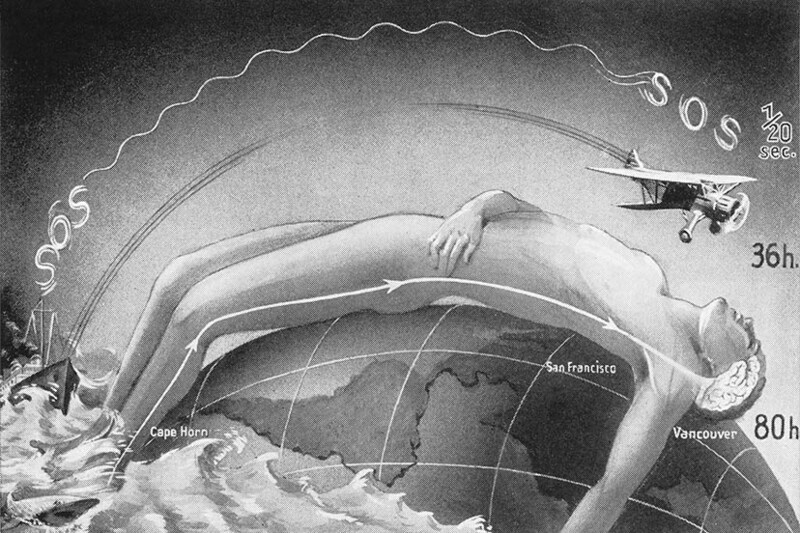 The intertwining of science, art and technology: An animated and interactive installation based on the poster of the same title by Fritz Kahn from 1927. As this year draws to a close I, like many people, just remembered “hey, I’m supposed to come up with a list of ways to make myself feel better next time this part of the year rolls around!” I’ve never been that into the whole New Year Resolution thing, despite being a sporadic list-maker. For some reason, I tend to do that sort of thing on my birthday because that’s when my new year starts. How self-centered of me! 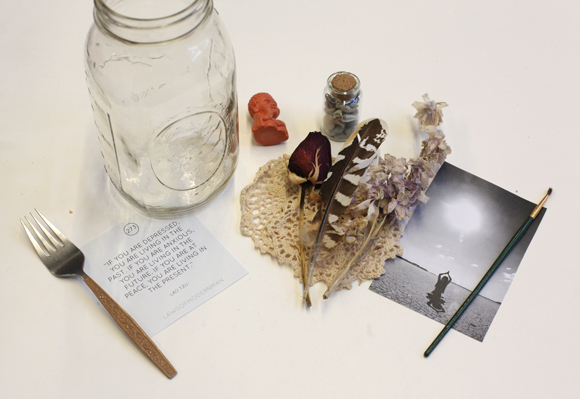 That’s why I kind of like this idea of a pretty jar filled with objects that act as visual reminders of what you’d like to accomplish in 2013. Little things, like a fork to remind you to eat healthier. A pen to urge you to write. Maybe a picture of place you’d like to go. 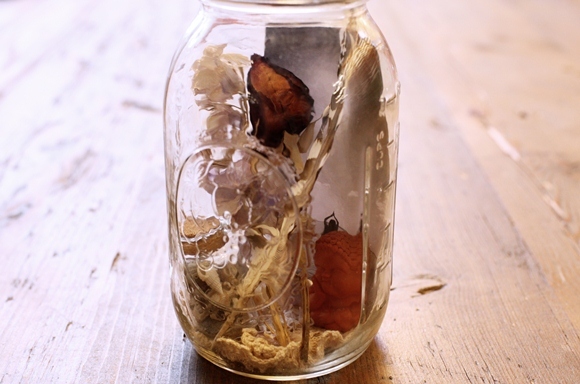 What’s in your dream jar? Inspiration for a Thanksgiving Feast? 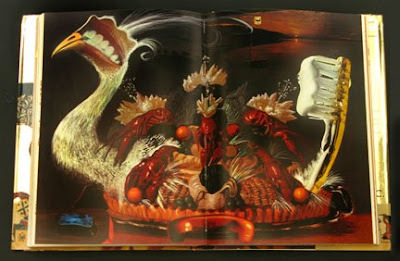 With the holidays coming up (ahem *cough cough*) I thought it was a good time to bring attention to one of my all-time coveted items: a cookbook celebrating gastronomy and passionate, decadent consumption of food and art featuring elaborate food still lifes, original drawings and paintings by Salvador Dalí. “Nocturnal Cravings”—Chapter 11: sweets and desserts. 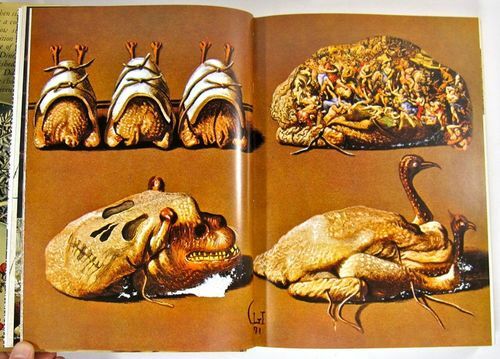 In conjunction with the release of the book Dalí also produced a suite called Les Diners De Gala (Released in 1977). 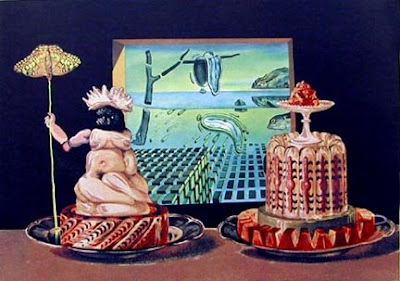 The 12 lithograph suite is a surrealist twist on some of Dalí’s favorite meals. 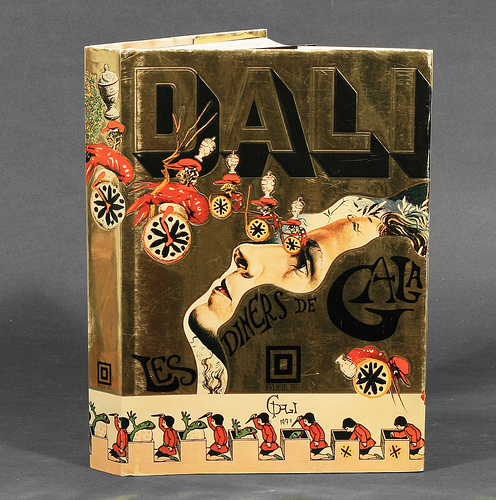 These works are a result of Dalí experimenting with mixed media and they are often regarded as some of Dalí’s most unique prints. With 136 recipes in 12 categories, the collection of strange recipes includes an entire chapter on aphrodisiacs, correct use of atteletes (meat jewellery) and sketches of limbless dwarves eating eggs, among other things. “Soft Watches Half Asleep”—Chapter 11: sweets and desserts. “The I Eat Gala’s”—Chapter 10: aphrodisiacs. 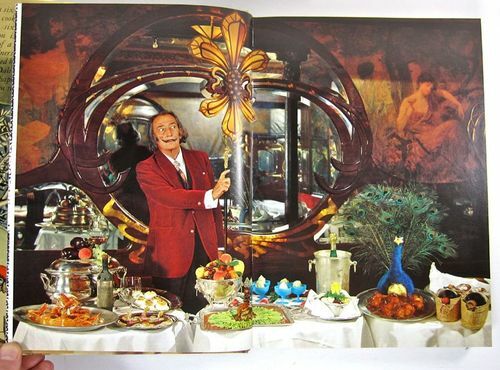 Here is a newsreel from 1941, in which Salvador Dali designs and hosts a party held in the Bali Room of the Hotel Del Monte, Monterey, California. The event was titled Night in a Surrealist Forest and it was a fund raiser to help European artists displaced by the war. 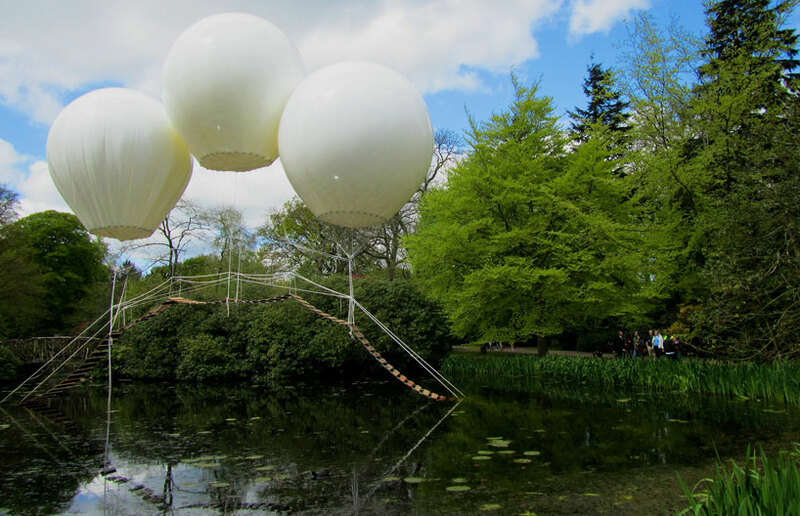 Imagine traipsing through the countryside and coming upon this dreamlike floating bridge, suspended by three balloons over a lake in Tatton’s Japanese garden in the UK. 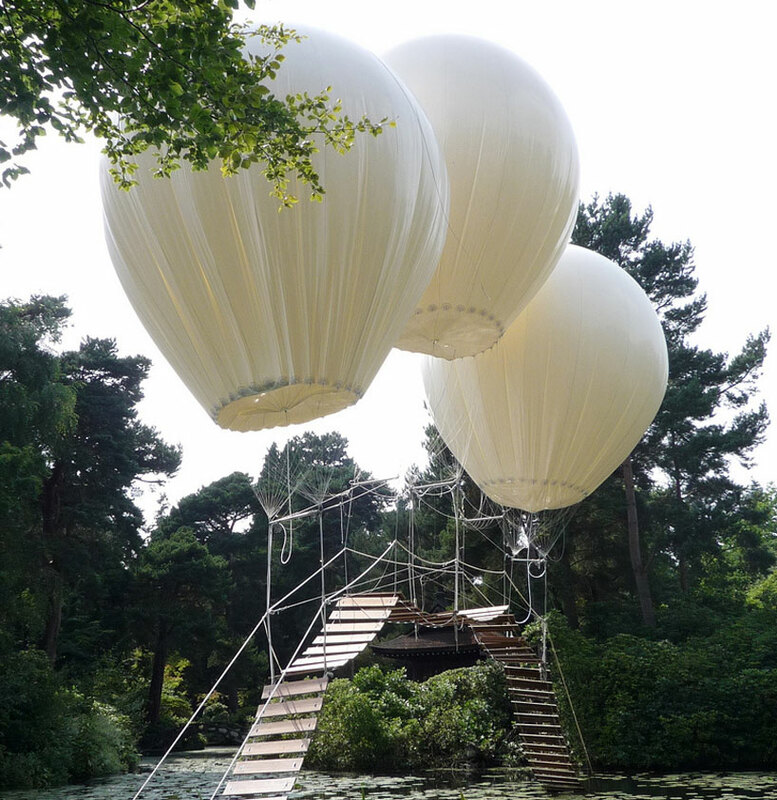 French installation artist Olivier Grossetête‘s work ‘Pont de Singe’ delicately melds surrealism with the technical disciplines of design and engineering. 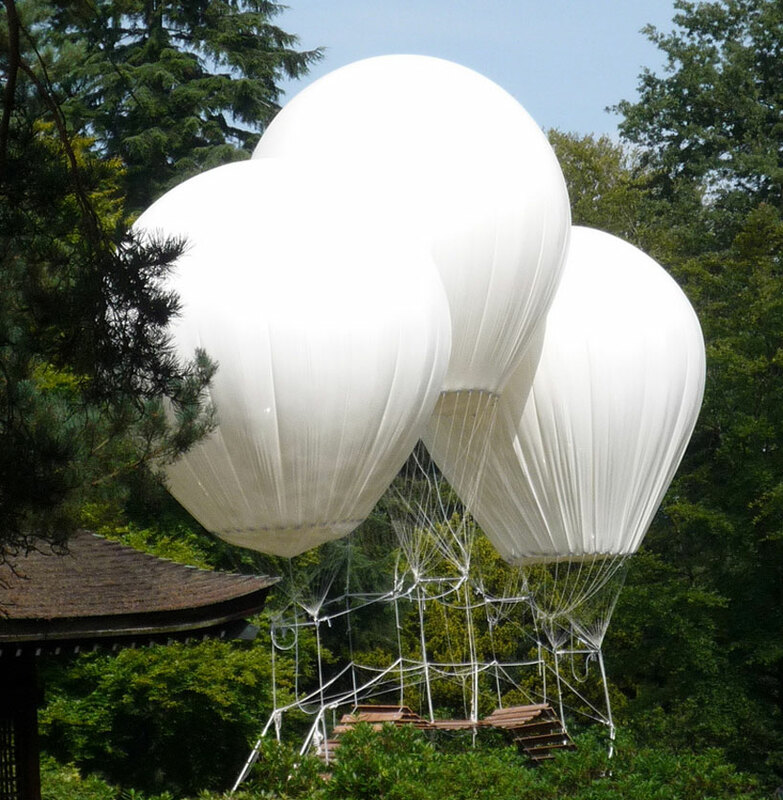 This piece is an extension of his earlier and more fanciful 2007 work ‘Pont Suspendu’- an installation of even more surrealistic dimensions consisting of three large balloons supporting a bridge-like structure, hovering in the air over Château Ferry Lacombe in Tret, France. 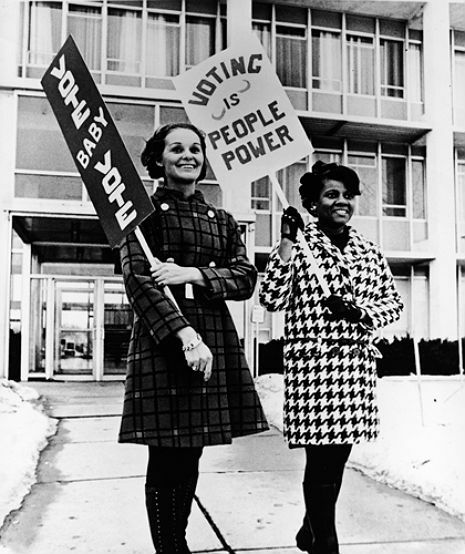 Just a reminder….get out today and do the right thing! 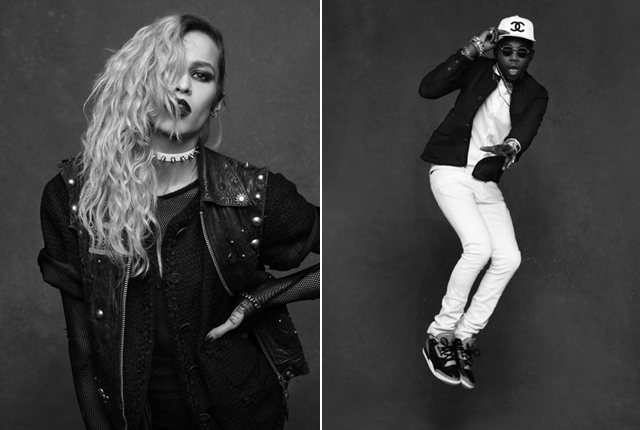 How does personality transform fashion? I’ve always been fascinated by the indefinable ways that the same piece of clothing just looks different on everyone. 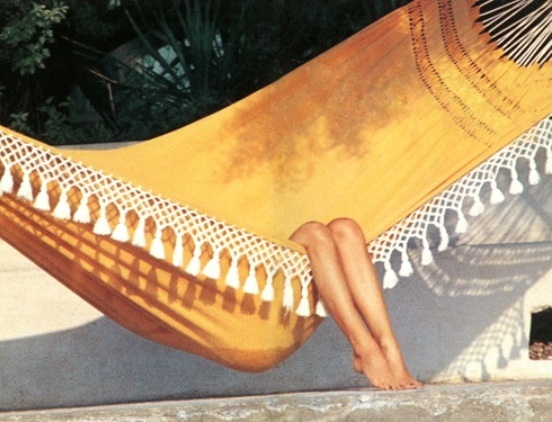 The slope of a shoulder, the way that fabric drapes and clings in different places; even the attitude of the person wearing it can completely change the way something looks, like an unconscious and purely physical interpretation of thread and cloth. The Little Black jacket features a simple black tweed jacket worn over 100 different ways on over 100 distinctly different personalities. 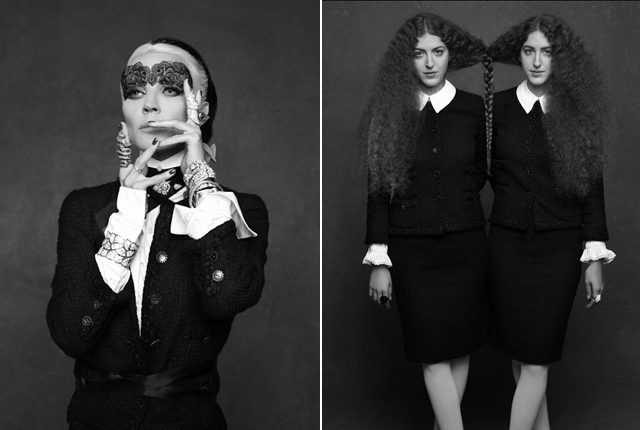 Shot by Karl Lagerfeld himself, and styled by Carine Roitfeld, The Little Black Jacket has his favorite muses wearing the label’s iconic jacket. 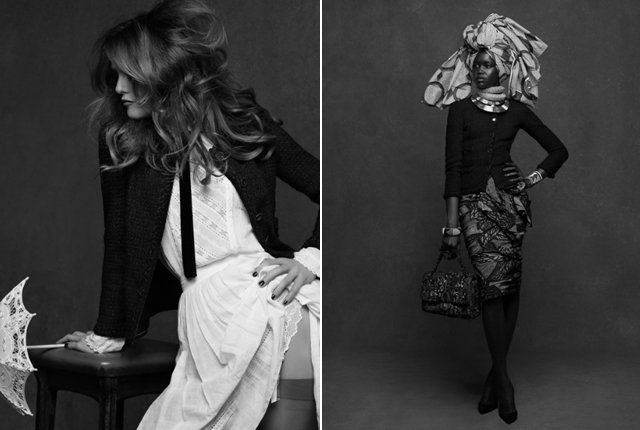 Rather than a book-long ad campaign for Chanel, it seems to be more of a study on the transformative power of personality on fashion. These Die In The Jungle tights from Les Queues de Sardines have all kinds of crazy plants, animals and tribal designs. I think they would make me feel like a tree frog! I feel like dressing gets much easier in the fall. 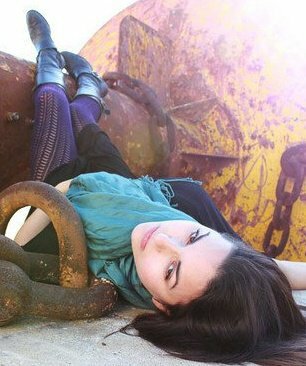 Throw on some tights and a scarf with any basic dress (black!) and people instantly think you’re “put together.” Add boots and earrings (this may add another 30 seconds to your five-minute dressing time) and you are a bona-fide fashion plate. 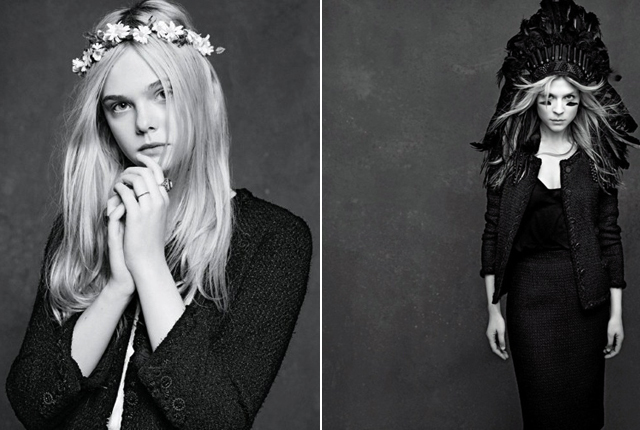 What’s your fall fashion formula? A month or so ago, I talked about the science of procrastination. Well, it continues to fascinate me, especially now that I’m back in school and am myself a case study in this intriguing human behavior. It’s nice to know I’m not alone! I can’t tell you how many convoluted things I come up with to avoid doing work, to take a break from work, or even in the guise of facilitating work. Many a night do I find myself drifting away from the articles I’m supposed to be reading for class and popping in to such addictive internet diversions as Foxybingo.com (yes we all have our vices) and catching up on an endless array of blogs. 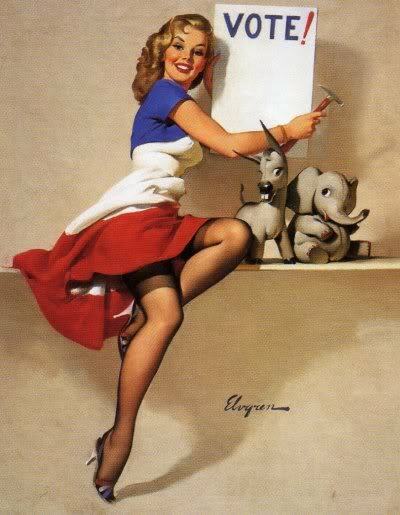 Now, I better get back to my take-home Economics midterm….because having a blog is the best method of procrastination out there! 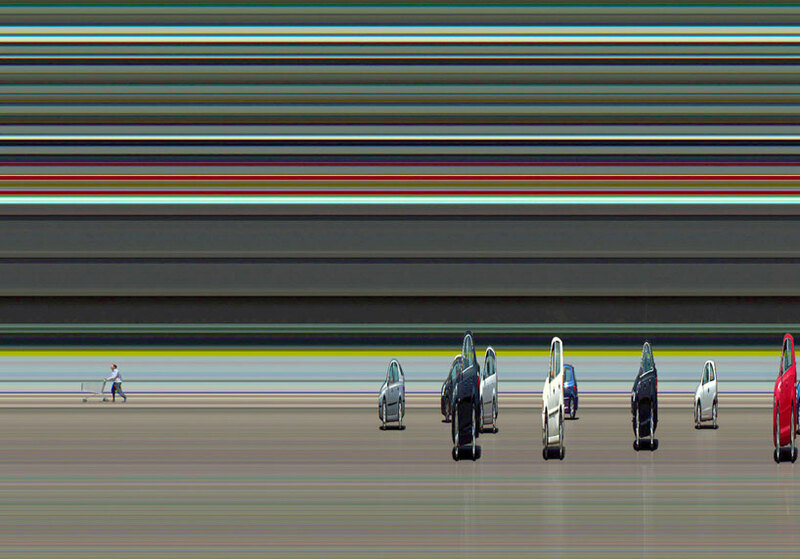 California-based artist Jay Mark Johnson has created a series of time-based images that appear to be photoshopped; however, the effect is achieved through a specially built slit camera that emphasizes time over space, effectively condensing motion into sweeping bands of color. It gets crazier- an object is recognized by the camera according to the rate of movement as opposed to distance or size, so that viewing the image by scanning from left to right is essentially like going backward in time. The project began as an accidental effect while Johnson was taking high-resolution panoramas with an US85,000 rotating slit-scan camera. He noticed the accidental effects the device was capable of, and began stopping the rotation and focusing in on one small area. By controlling the period of time that the camera registers a scene (which is represented visually by one vertical sliver) Johnson can capture the moving subjects line-by-line. 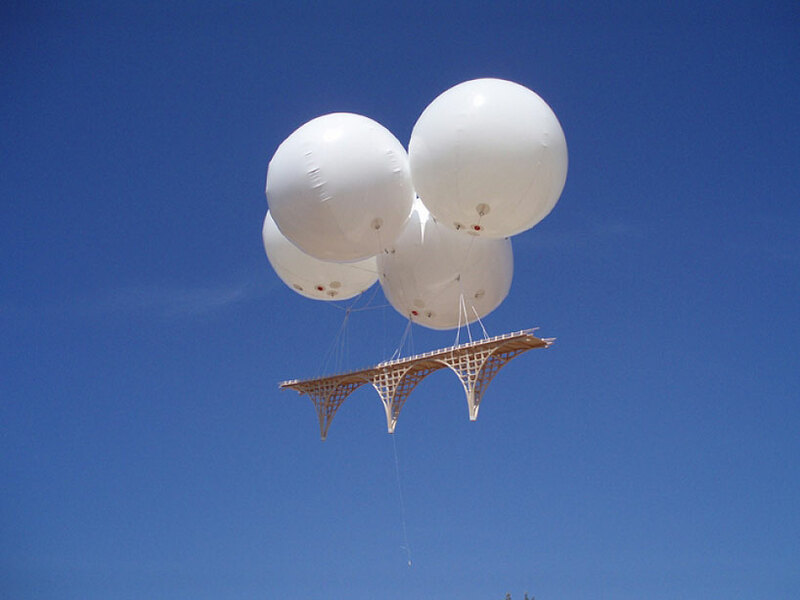 As a result, slow-moving objects appear stretched, while faster objects are condensed.